Tiffany, the iconic jewelry retailer, said on Tuesday that sales in the U.S. were hurt by all the chaos surrounding its flagship store on New York City's 5th Avenue, which just so happens to be neighbors with Trump Tower. While Tiffany didn't mention the President-elect by name, it was clear what Tiffany was referring to when it said that there has been "some adverse effect on traffic" at the 5th Avenue location due to "the impact of recent election-related activity." Tiffany added that there was "softness" at this store and warned that sales could be hit again in the fourth quarter. The 5th Avenue store accounts for close to 10% of the company's total sales. Overall sales for Tiffany's U.S. and other North American stores in its most recent quarter fell 2% from a year ago. 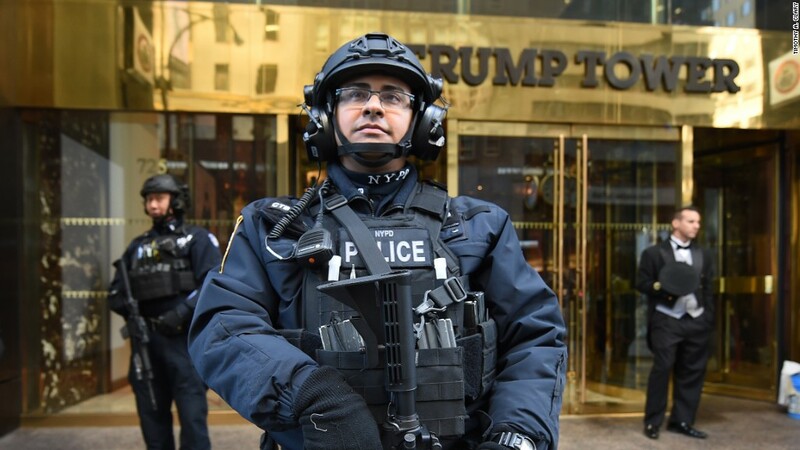 Security has been heightened on 5th Avenue since the election. There have been some protests outside Trump Tower. But much of the police activity is due to the fact that Donald Trump lives in Trump Tower and has been holed up there since the election. Tiffany CFO Mark Erceg added during a conference call that there were "minor disruptions to pedestrian foot traffic" around the 5th Avenue store and that Tiffany was "understandably cautious as to how the situation might impact sales over the coming weeks." But it's not all bad news for Tiffany. Sales in China and Japan were strong, helping to lead to a slight increase in overall revenue for the company. It's the first time Tiffany's quarterly sales rose since November 2014. Tiffany CEO Frederic Cumenal said in a press release that the company was "encouraged by some early signs of improvement in sales trends." Investors chose to focus on that instead of the weakness in the Big Apple. Shares of Tiffany (TIF) rose 5% in early trading on the news. Like most retailers, the holidays tend to be a busy time for Tiffany. And the company reaffirmed its outlook for the fourth quarter, a sign that it does not expect any further weakness at its flagship store to drag down results for the whole company. Nonetheless, it's a tumultuous time in the jewelry business -- putting aside all the election-related madness. Tiffany's competitor Signet (SIG), which owns discount jewelry brands Kay, Jared and Zales, has been accused of selling fake diamonds. And online jeweler Blue Nile (NILE) is in the process of being taken private by a group led by Bain Capital. Bain is the private equity firm co-founded by Mitt Romney, the 2012 Republican presidential nominee who is rumored to be a contender for Secretary of State in Trump's administration. So all things considered, Tiffany is actually holding up relatively well -- despite a continued police presence in New York that threatens to keep tourists and other shoppers away from 5th Avenue.